Keeping your data secure is our number 1 priority. Your data is encrypted, backed up and hosted in highly secure facilities. Our security and features enable your organisation to fulfil its obligations in regard to the electronic storage of confidential or client information. Excellent service keeps cancellations to a minimum. 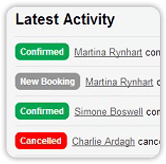 YellowSchedule is the only scheduling system to offer Green Dot Confirmation. We’ve made it easy for your clients to confirm their appointments with a simple Yes or No text based response. Their response is instantly displayed on your calendar making it easy to view your confirmed appointments all in one place. This unique system has proven to reduce no-shows rates by 30% more than simple text/email reminders alone. Want to see Green Dot Confirmation in Action? Simply enter your cell number below and we’ll send you a quick test to show you. We streamline your entire appointments process, giving you more time to do what you do best. 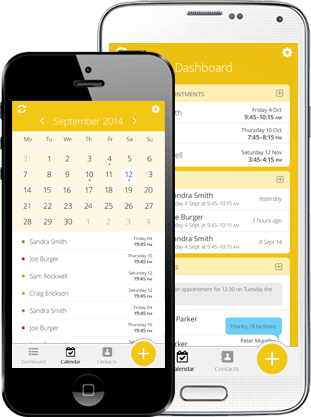 Help your clients to keep their appointments and increase your revenue. Shown to reduce no-shows by up to 70%. Allow your clients schedule an appointment at their own convenience, remember that 60% of online bookings are made outside of office hours! Get organised! Reduce your admin with automated actions and integrated client CRM and notes right inside the appointments scheduler itself. I’m really impressed. I saw patients confirm within seconds of being scheduled for their appointment. Clinical Social Worker/Pediatric Psychotherapist Dallas, TX. Your customers & clients respond to automated appointment reminders to confirm or cancel appointments. Reminding your customers involves them actively in the decision to attend and results in much higher participation rates. 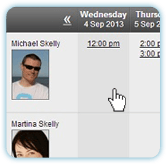 Cancellations prior to the appointment enable you to reallocate appointment slots or redeploy your staff and resources. Reminder software that improves your profits. Hi Chris. You have an appointment with Elaine Lee on Monday 21st October at 7:30pm. Reply “yes” to accept or “no” to cancel. Billing your clients just got easier! Payments, deposits, pre-payments and receipts are all handled simply and securely and integrated into the appointment booking process. 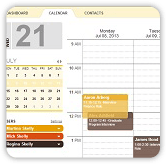 Your businesses fully featured calendar software!